There are many ways to protect your computer from potential security issues. In order to avoid the likes BadBlock Ransomware, for example, you should refrain from opening spam email attachments and visiting websites that have a lot of annoying flash pop-ups. We decided to talk about this ransomware infection because it is one of the latest threats out there, bullying computer users into spending their money (basically) for nothing. Read on to find out more about this application and how to remove it. It is important to note that ransomware removal is just one of a few things you have to do to restore your system to its previous state. 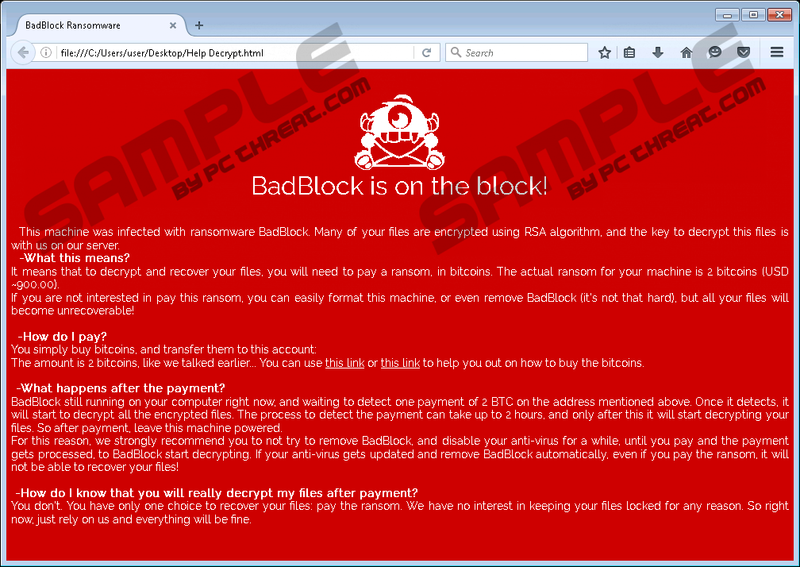 Computer security experts say that BadBlock Ransomware is technically a Trojan because it uses the same distribution methods. However, our traditional Trojans are malicious infections that enter systems surreptitiously, unleash their payload, and then continue to run in the system background without the user even noticing that something went wrong. This ransomware infection, on the other hand, does not even try to hide itself. It needs to convince users that there is no other way out of this situation, so it makes its presence known from the very beginning. You will know that you have been infected with BadBlock Ransomware from the notification it displays on your screen. The message covers your entire screen, and it is programmed to always remain on top of your desktop. You may drag it to one or the other side of your screen, but it is not possible to close that window unless you delete the ransomware itself. BadBlock is on the block! This machine was infected with ransomware BackBlock. Many of your files are encrypted using RSA algorithm, and the key to decrypt this files is with us on our server. It means that to decrypt and recover your files, you will need to pay a ransom, in bitcoins. The actual ransom for your machine is 2 bitcoins (USD ~900.00). As you can perfectly see, this ransomware application is rather greedy. The average ransom amount across different infections is usually around 542 USD, so this program clearly asks for a lot more. Computer security researchers suggest that the payment amount may tell you more about the type of ransomware you are dealing with. For example, ransomware programs that are still on a test may have really small ransom payments, but if you encounter a program with a big payout, then you can be sure that you are about to fight with the real deal. What happens to your files when you get infected with BadBlock Ransomware? They do not disappear anywhere, but you can no longer access them because the program encrypts them. Your files, no matter what format they were, consist of bytes of information that is laid out in a particular fashion. Encryption scrambles those bytes in a new pattern, and, as a result, your system can no longer read your files. The only way to put those pieces of information back together again is to use the private decryption key. As you can probably tell, the ones in possession of the key are the criminals who created this program. We would like to discourage you from transferring the ransom payment. For starters, you cannot be sure that the cyber criminals will really issue you the key. What’s more, something might go wrong with their connection (as it is rarely stable), and they may not be able to send the decryption key even if they intended to. This is where a file backup comes into the picture. We believe that users have bits and pieces of their files either in some external hard drives, USB flash drives, their email inboxes or cloud storage drives. From there, you can restore your files (that is, copy and paste them back into your PC), but please do that only when you have had BadBlock Ransomware removed. If you follow the instructions below, you will have no problem in deleting the program’s files from your computer. Nevertheless, to be absolutely sure that all the malicious files and programs have been terminated, run a full system scan with the SpyHunter free scanner, and to not hesitate to invest in a legitimate antispyware tool if need be. Press Win+R simultaneously and type %ALLUSERSPROFILE% into the Open box. Find the Network Prosoft folder and delete it. Empty your Recycle Bin and scan your PC with a security tool. Quick & tested solution for BadBlock Ransomware removal.